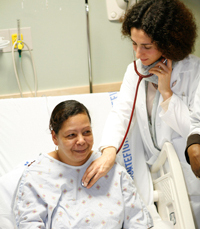 Our Mission is Simple—Improve the Health of Underserved Communities in the Bronx and Beyond. We believe health is a state of physical, social, economic, psychological, and political well-being. We believe health care is a right that is a matter of social justice. There is a social component in the origin and course of disease; therefore, to promote health, we support grassroots community action and progressive change in public policy and social structure. We are dedicated to the full application of the biopsychosocial model through understanding the ecological context of the patient's and family's social system in underserved communities. We are dedicated to the integration of the perspectives of public health and clinical medicine with lessons learned from complementary therapies in our health care and healing. We seek to work collaboratively with patients and their families, colleagues and communities to provide excellent patient-centered care, explore innovations in primary care, and support a context that fosters health by providing culturally sensitive and respectful care that empowers all those involved. We seek the skills to effectively fight institutional and personal racism, sexism, classism, ageism, heterosexism, and other forms of prejudice and exploitation because they adversely affect the health of our patients and our provision of health care.